The NSX feels weirdly underrated, despite really being Japan’s premier supercar. This is in light of the numerous articles and news coverage pointing to this car taking the likes of Ferrari back to school on how to make a real quality performance machine – so even though this is technically a Type R model (which traditionally should be Champion White), it had to be bright red. I had already built the modern 2017 successor NSX a while back (and decked it out with some Racing Miku for good measure), so I wasn’t really planning on building the first generation car so soon. Alas, this ended up being a bit of an impulse buy after I found it dusty and forgotten in a hobby shop in San Francisco, and given that it was priced lower than anything online, I thought why not. I originally planned to get the Fujimi NSX-R, which was the 2002 facelift version of the car with the fixed xenon headlamps. Looking back on it compared to this Tamiya Type R, I’m glad I didn’t go with that original option. Upon further review it looks like the Fujimi kit was severely lacking in detail and didn’t even feature a full motor. I actually didn’t even know the NSX had a Type R skew, though I suppose Honda did it for nearly every performance car they put out (barring the S2000 – hello Honda?). As was typical with their Type R editions, the main name of the game here was weight loss – this NSX-R was nearly 300 pounds lighter than the standard model. A big selling point for me on this kit was the inclusion of photo-etched parts in the kit. I’ve never actually worked with them before, so I thought it would be a good chance to experience the stuff before I start buying aftermarket PE parts. A pleasant surprise – masking stickers for the front and rear windshields. They’re so exclusive to the NSX-R that the front windshield sticker features a little print of the actual car. Just from the runner parts it looks like the motor will be fairly detailed. It looks like the rear windshield has hinges up top – and you know what that means – an opening and visible engine compartment. You played yourselves, Tamiya – your older NSX is already better than your newest and latest model. This runner had me particularly excited when I opened it up – on the lower right it looks to be the pop-up headlight housings, and they’re connected to each other by a rod in the middle. You know what this implies?! Other goodies that come exclusively with this Type R are racing seats by Recaro and what looks to be a special steering wheel. I’m actually really surprised two dash options are given, since I’m pretty sure the Type R was a JDM-only car, so it’s weird for Tamiya to include a LHD option. The NSX has an extremely unique body style, thanks in no small part to its mid-ship design. The A-pillars here are scarily thin; about half as wide as a toothpick. Despite being a Type R, we don’t get any fancy aero bits or big wangs that come from factory. 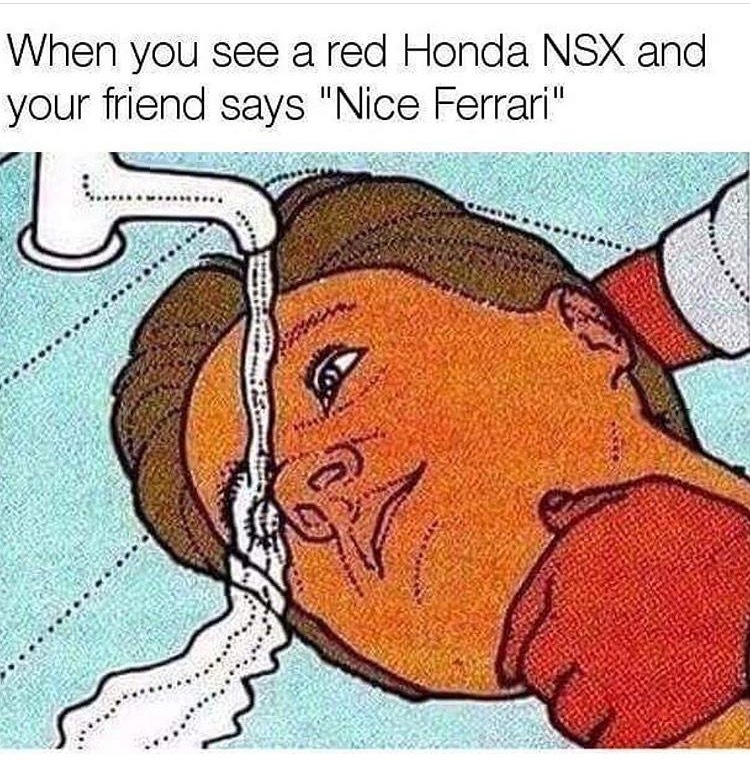 Instead only the stock spoiler is included, which basically just forms a bridge at the NSX’s tail. This wasn’t aggro enough for me, so I went about modifying it a bit. I wanted to keep it as a bit of a larger stock wing, rather than a big GT Wing. The idea was just to cut off and remake larger pedestal pieces, which raises the spoiler’s overall height. Scratch built pla plate was used for this, with putty to fill in the new seams. I dig it. Not too ostentatious, but enough of a difference to be noticed, I think. Did I mention this was a mid-engine’d car yet? No? Well the giant hole in the chassis between the rear wheels should tip you off. Skinniest seats I’ve ever seen. I actually think a standard aftermarket bucket seat wouldn’t fit in the NSX’s tub now, given how small these are. I know the Type R focused on being the spartan version of the NSX, which means very limited creature comforts like air conditioning and heavy sound systems, but I still found this bit humorous. To cover up what is presumably the radio controls, Tamiya doesn’t go out of their way to give you a newly molded dash that deletes the radio – they just include an extra little plate of plastic that you’re supposed to cover it up with. 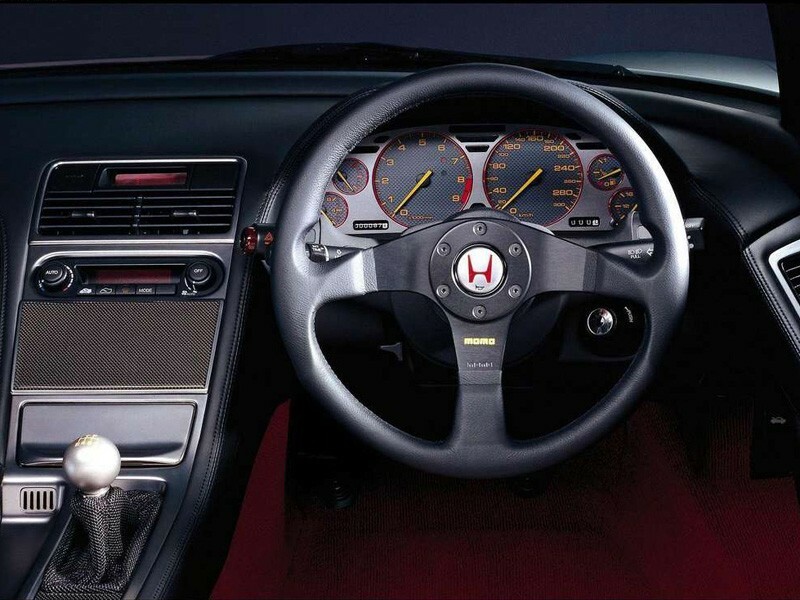 For clarity, I’m not saying Honda did this on their actual Type R – on the real car the radio unit is of course entirely removed and replaced with a blank carbon plate – but Tamiya knows no shame in just making us cover it up. I was actually also really surprised to see that two rear view mirrors are included, presumably for left hand drive and right hand drive. All other models I’ve built with variable driver sides have had only one mirror – because why should rear view mirrors be limited by driver orientation? Maybe the passenger gets one too in the NSX, so they can both laugh at the cars they’re leaving in their rearview. The modern 2017 NSX comes with larger rear wheels than fronts, but I was genuinely surprised to see that the story is the same with the first generation car. These are actually really nice wheels for a stock car – probably because they were specially produced by Enkei for the Type R.
Nice as they are though, it’s not JDM or tuner enough if we didn’t run aftermarket wheels. These Gram Lights are a little too close in design to the Work Kiwami’s I’ll be running on my upcoming Subaru, but they were a good size and better than other options, so I went with it. Masking the rear and front windshields. The Motolov Liquid Chrome markers are proving to be extremely useful, since apparently a lot of engine and exhaust components call for chrome. Getting the 3.0 litre V6 and subframe together. It must be a weird experience changing the oil on a mid-ship car. It’s a rear-drive car, but the motor is still mounted transversely because mid-engine. Inserted. That semi-gloss black section right before the rear wheels and under the subframe brace is the fuel tank – so refined was the NSX’s engineering that it was apparently placed there deliberately behind the cabin so the car’s weight balance wouldn’t change as fuel was used. These seats are supposed to be Recaros, but apparently I can’t apply Recaro decals properly to save my life. I went through two sets, one of which was a spare I pulled from my VeilSide Fortune’s decal sheet – and I broke both. So I settled on making them Bride’s instead. Looks about right? I have a very childish reason for picking red for this car. We always hear about how the NSX was the car that taught Ferrari how to make supercars again – and it’s not uncommon for the NSX itself to be mistaken for a Ferrari. So, I went off that stereotype and decided to paint it red – like a Ferrari. I always really liked how these cars had black tops from factory – apparently some owners didn’t, and commonly paint their tops to match the body color. Interior decal’d and flat coated. I didn’t really know what to paint the back of the seats, but I suppose it didn’t matter much at the end of the day since they won’t be very visible once they’re in the cabin. I opted for gunmetal because why not. Just a nice tub. The blanking plate for the radio still gets me. Tamiya even included a little carbon pattern water slide decal to cover it up, though it still sinks a bit where the radio control knobs were. Motor basicallty finished, and yes it does say VTEC on the top cover, bro. Instead of attempting to micro paint the letters in, I decided to just re-purpose one of the H decals originally meant for the hubcaps on the wheels for the engine cover, and left it at that. The modified spoiler is black because red cars with black roofs and black wings are just cool. They’re even cooler with concave thin-spoke wheels. Of course, we can never just have easy compatibility with Aoshima wheels and Tamiya models. The usual wheel hub cutting had to be done, but at this point I’ve done it so often that it’s second nature. Better, but that fitment’s still just a tad too aggressive for my taste. I’m all about some poke, but it needs to be subtle. I’m really liking how the finish is shaping up on this kit; I’ve never gotten any gloss this smooth before without polish. The secret? Build up the color coats and finish it off with a thick, wet coat. The disadvantage, however, was that the thick paint ended up eating away a bit at the paint below, meaning I had little areas around certain edges that were showing the plastic underneath again. Thankfully these were just edges, and proved to be a quick fix via some paint decanting and brush work. It happened again. The same issue weird hazing issue occurred on the rear windshield after I peeled the masking tape off, exactly as it happened on the R34 Skyline’s rear window. Thankfully it’s less pronounced than it was on the Skyline, as it only occupies a corner of the piece’s bend. I still don’t understand how or why this happens, though I’m fairly certain it’s caused by the masking seals. It seems like adhesive residue, but no matter what kind of solution or thinner I use to attempt to clean it off, it doesn’t work. I wanted to keep the rear windshield completely clear since there’s actually a nice motor beneath it to be seen, but with this hazing happening I really had no choice but to mitigate it as much as I could with some clear smoke tint. I kept it as light as possible, and while it didn’t completely hide the imperfections in the plastic, it helped a lot. You’ll only notice the haze at certain angles where the light catches it now. Excited for the pop up headlamps. Housing insides were painted chrome. This was the photo-etched piece I was most looking forward to in the set. Honestly most of the photo-etched parts were kind of lame – they were mostly just metal grille meshes for the vents, which I could’ve made with regular mesh. But this engine bay cover screen was actually really cool – nothing on my part could make regular mesh look quite this nice. Time to screw with the wheel fitment some more. Because cutting the wheel hubs didn’t quite bring the wheels in as much as I wanted, I now needed to tackle the brake rotors and calipers to get the tires properly fitted under the fenders. I tried cutting the hubs off the stock rotors with my heat knife, but just ended up melting the entire assembly into a gooey mess, so it was time to resort to some spare rotors I had lying around. I’m pretty sure these are still from my original R32 GT-R, but they’re blank rotors with hubs that I could cut down, so they fit the bill. Rotors sliced down considerably to make them thinner, and then fitted to the NSX’s axle’s. Stock NSX rotor and caliper on the left, aftermarket unit on the right. And to go the extra mile, I took some of the leftover Brembo decals from the VeilSide Fortune for use on the NSX’s new big brake kit. Unfortunately some of it rubbed off while I was making adjustments to the final fitment, but most of it is still there and can be seen through the thin-spoke wheels. The system to insert them into the body and have them articulate up and down is simple – the two housings are connected by a pole in the middle, which is then held in by a half-pipe glued into the underside of the hood. Moving one headlight up should move the other with it. But this process wasn’t quite so simple. For whatever reason it took nearly two hours of fiddling with the housings to get it to line up perfectly and open and close without chipping paint and refusing to come up. There are grooves in the plastic under the hood to guide you in mounting the half-pipe assembly, but for whatever reason it took a while to actually get it all to work. By the time I had successfully inserted the lights, there was a barbaric amount of paint chipping around that area, so of course I had to go back and touch it up with decanted spray. I know most modelers would’ve just said screw the pop up function and kept the housings glued in the closed position, but I need pop up headlights in my life dammit. Rear windshield taped to hold it in place while we turn the body over to get the front windshield and side windows in. Because it was so effective last time with the Fortune, I decided to reuse the same technique of using hot glue as a fast-dry non-fogging adhesive for the window assembly. A few dabs along the bottom edges were enough to keep it in. Photo-etched grille pieces inserted. Of course, they came as metal but were painted black. They actually look crisper than the regular mesh I use, but I was kind of bummed that these were most of the PE parts included; some metal rotors or pedals would’ve been nice. The NSX’s unique taillight bar is one piece, painted clear red on the inside. And of course with a chrome backing to make the clear parts pop. Finally, I decided to try for badging the nose with my last remaining Acura decal – leftover from the second generation NSX kit. Part of why I wanted to go this route was because the Honda badges included in this kit are of the Type R red backing variety – which means on a red car body they’d kind of get lost. Another part is just because I think these metal transfer badges look cooler than regular ‘ol water slides, and I built the car as the LHD model after all, so it’s the North American Acura rather than the JDM Honda. Ironically there’s a Honda Type R badge on the steering wheel already, but I didn’t mind much. I also only had one of these Acura badges left, so only the front is getting it; the back will remain blank. The last issue to contend with – annoyingly, the body fit over the chassis was very poor. I couldn’t for the life of me figure out why the chassis floor wasn’t fitting all the way under the body, no matter how much I took it apart and attempted to adjust things to make them fit. I thought for a while that it was the thick hot glue beads around the windows that were preventing the inside doors from riding up all the way, but even after I peeled those beads off and re-glued the window assembly from the roof, it still wouldn’t go in all the way, with some chassis peek underneath near the sideskirts as seen here. My ultimate solution was to just sandwich the car as much as I could and apply hot glue into the inner fenders, between the back of the inside fenders and the inside of the body shell. This actually proved to mostly work; there’s still a sliver of chassis visible under the sideskirts, but for the most part it’s all clamped together. Hands down my favorite kit I’ve built so far. I’ve actually developed a newfound appreciation for this car – after spending a lot of time researching its history and features during this build I think it’s at the top of the attainable dream car list. It’s definitely my cleanest and most complete build so far – I actually think I’ve finally achieved the ideal gloss finish I’ve been looking for. I’ve recently started going back and editing a lot of my past builds – as I build brand new kits, I feel like my older models become out of place as I refine my skills and the style I’m going after evolves. I really liked the NSX as it was, but there were still things about it that bothered me and I thought I could improve on. Ironically, I liked the original Gram Lights I threw on there at first, but after seeing some NSX’s in person, I found myself really liking the staggered fitment that a lot of owners seem to favor – makes sense, given the factory wheels were also staggered. The problem with running different diameter wheels on model cars is that staggered sets don’t really exist – I only know of one pre-staggered wheel set, and it’s a set of 19″ and 20″, which are way too big for this car. So, I’m left with hunting down different sizes of the same wheels. Of course, my choices were pretty limited, even with the resin wheel aftermarket. I eventually found that Aoshima made a set of Work Meister S1’s in 18 inch and thankfully, Hobby Design made the exact same wheels in 17 inch. The Aoshima set came in chrome and had a set of stretched tires – as much as I would’ve loved to use them though, with staggered wheels I now also have to consider staggered tires. Hobby Design’s resin S1’s are actually true two-piece assemblies. The face slides up from the back of the barrel, making painting much easier than it would otherwise be. Unfortunately, the Hobby Design wheels didn’t come with any tires – this is when I discovered that 17″ low profile tires are very difficult to come by in the model car aftermarket. The only ones I could find are stock sizes, with sidewalls in the 45-55 range. Enter these Mugen wheels and tires made by Pegasus Hobbies – they don’t explicitly size their wheels, but just from comparing them in size to my Hobby Design S1’s, I can confirm – they are 17″. I believe Pegasus produces their wheels and tires in-house, so none of their stuff is branded. These are unmistakably Mugen wheels, but it won’t say that anywhere on the actual wheels or on the packaging. The tires are similarly unmarked, which is a bit of a shame but I’ll take what I can get, since these are the only 17″ low-profile tires I’ve found so far. Chrome lips are painted in with Motolow Liquid Chrome, and the faces done in Tamiya gold. Technically I didn’t have to apply the Motolow chrome over the Aoshima wheel lips since they already came as all chrome, but I did it anyway to match the sets better – the Liquid Chrome comes very close to that plated chrome finish when applied correctly, but it’ll never be a 100% match. The 17″ tires off of the Mugen wheels fit on the Hobby Design S1’s, but not as snugly as I would’ve liked. They were still a loose fit, even if there were no gaps from the lip to the tire. As such, I attempted the good ‘ol trick of shrinking rubber in a bowl of boiling water, but I should’ve known this doesn’t really work on pristine clean rubber like this – apparently boiling rubber is only good for dirty stuff that’s soaked up a lot of gunk/oil/contaminants, as the boiling water releases that junk from the rubber and allows it to return to its original size. Ironically, the 17″ Hobby Design wheels are wider than the Aoshima 18″, even though the 17″ are supposed to be up front. Cutting resin isn’t nearly as clean as cutting plastic. Now all four will be the same width. Finally some spokes fat enough for me to add some Work decals on. The original brakes and rotors were looking a little boring (and beat, after pulling them off the hub assembly and old wheels) so it was time for an upgrade. I’ve been saving this rotor set for a while – it’s supposed to be a set of two vented rotors (where each slotted plate sandwiches over that saw-like plate) but I decided to stretch it and use it for all four of the NSX’s rotors. As usual, the rotors are being glued onto the wheels first, though the Aoshima wheel hubs will have to be cut down since they stick out so far. So, wheels and brakes are great, but I still wanted to add a little more flair to the NSX’s body. I feel bad always resorting to just cutting pla-plates out as splitters and ground effects since it feels cheap, but so far it’s proven effective as a way to enhance the look of a build. From a brief Google Image search, it looks like these kinds of splitters aren’t super popular for the NSX. Most owners seem to go with a molded lip that attaches and overlays the factory lip, but I obviously don’t have the skills to sculpt something like that from scratch. The best I can do is cut a plate out, sand the edges down to get some fancy bevels, and stick it on, calling it a front splitter. I really wanted to be lazy, but it looked way too funny with just a big aggressive splitter up front and nothing else for the rest of the body. Thankfully the side splitters were a piece of cake – the little rear spats took a bit more effort though. I was also going to keep being lazy and just paint the ground effects parts gloss black and be done with it, but eventually reconsidered and decided to wrap them all in proper carbon fiber. Thankfully all these shapes were very easy to just trace out and lay some decals on. And because I have a million resin canards left over from my R35 GT-R build, we’re cutting a set down to mount to the NSX’s front bumper. These resin Craft Square mirrors also came with the canards as a bundle back – in an effort to use as many aftermarket parts on this build as possible, they’re going on the NSX. The unfortunate thing is that the mirrors didn’t actually come with…well, the mirror part. It was really just the housing, so I broke out some super thin pla-plate and cut out the mirrors myself. Painted chrome with Motolow markers. Don’t worry, it looks gnarly here, but it dries smooth and shiny. Embarrassingly, the original Type-R style wing I scratch-built for this car was, uh, very crooked. To keep the ostentatious carbon theme going throughout the car, I figured a giant GT wing slapped on the rear deck would round out the look of a more track-oriented NSX. This marks the first time I was actually brave enough to finally try gloss coating the carbon decal parts. Remember I did it once before, it turned out horribly, and I never dared do it again. Upon reflecting on that incident though, I reasoned that it was probably because I was an idiot and didn’t follow the explicit instructions on the decal paper – which was to let the decal dry out for 72 hours before clear coating, otherwise the clear coat will react negatively with the moisture still trapped under the decal. My dumbass previous self sent it immediately after applying the carbon decal, so it’s no wonder it screwed up before. This time I learned the valuable lesson of patience and actually waited to clear these parts for the NSX – and lo and behold they came out gorgeous. Uh, except the wing. I should mention now this GT Wing is actually pulled off my old S15 Silvia – it was a good size for the NSX so I really wanted to use it, but for some reason the clear kept cracking as it went on. I suspect it was from the coats being too heavy or being applied too far apart so the coat underneath was likely shrinking as it dried and showing cracks on the top coat. Either way, I threw the whole thing (decal and all) in the brake fluid vat to strip it – but I was impatient and didn’t want to wait for it to strip so it was time for the contingency. So, with the Silvia’s GT Wing out of the game for now, I had a few more options to choose from. After digging around my spare parts bin, I found that I had another GT Wing from Blitz (this one made out of resin, which came with the Blitz widebody aero kit that I’ll be using on my upcoming BRZ build) and the stock wing from my very first Japanese car kit – the R32 Veilside Skyline. The stock Skyline wing really drew me, since it was basically a chance to do a proper Type R wing, given my previous failed attempt to scratch build one. The design is surprisingly similar, though it looks like it’s a bit too wide for the NSX’s rear deck. The Blitz aero wing here was originally meant for a BRZ, but of course it’s just a generic GT Wing deck so it can really be re-purposed for any car. The wing stands were originally supposed to attach near the center of the wing very close together – that wouldn’t do for the NSX, so those segments were shaved. Carbon wrapped. It’s not as large as the Silvia GT Wing I wanted to use originally, but I like the look. I should’ve done this a while ago – the stock rear taillight assembly has a floating clear brake bar. Removed. Gluing the aero on. Made the mistake at first of gluing the sideskirts way too far out – you could drive by and slice someone’s ankles off with these! Test fitting the Skyline wing after it’s been cut down in size so it’ll fit where the normal Type R wing would go on the rear deck. So, this is where I was really torn – I prepped both wing styles because I just couldn’t choose which one to finally use. On one hand, the Skyline wing lends to a very clean and sleek appearance, very reminiscent of the subtle Type R wing that actually came with this car. On the other hand, the GT Wing just rounds out the crazy track appearance of the car and flows with the canards and splitters I already have installed. After much internal turmoil, I finally settled on the Skyline wing. Ironically, my main reasoning was to conserve parts – I could use the GT Wing for any other car in the future, since it’s a universal part, but the Skyline wing is really only fitted for a select few, and I’ve already cut it to the NSX’s dimensions. In an effort to have my cake and eat it too, I opted to add some carbon to the wing deck because the carbon fiber needs to flow throughout the car, dammit. So, uh, this is awkward. Did you notice in the above shots where the front and rear wheels were shown that the driver side front wheel looked strangely deep compared to the rear? Usually it’s the other way around – the rear wheels are supposed to have a deeper lip than the front wheels. I then tuned the car side to side and realized I made a crucial mistake – the Hobby Design 17″ S1’s actually had different offsets and lip sizes distinguishing their fronts and rears – and I was an idiot who didn’t notice when I was putting the pieces together. I accidentally used a rear wheel for the driver side front and a correct front wheel for the passenger side, so now my NSX has a deeper offset driver side front wheel. Thankfully this wasn’t a difficult fix – I just went into the box and pulled out the other front wheel that I neglected and painted it up to match the rest, and swapped the one driver side wheel out. Still, it makes you feel really dumb when you don’t notice these things right off the bat. And here I was sitting around like a doofus wondering why the offsets looked so weird sometimes. And finally, cutting out some decals to create my first model car rear window spine. I actually had to do research DENSO and 5ZIGEN to make sure they actually made parts for the NSX – would be very awkward to stick decals on that had no actual relation to the car. Not a bad glo-up, huh? This red finish has nearly zero orange peel – and most ironic of all, it required no sanding, polish, or wax. This was achieved with just thick and layered coats of gloss. That probably goes against all conventions of car model building, but if I can make that technique work from now on I’ll be golden. I actually think part of why this finish came out so well is because of the nature of the color – it’s a solid, bright gloss red, which seemed to gloss over much better than other pigments like orange or metallic colors. I have no real science of colors to back this up – it’s just what I’ve observed from the kits I’ve built so far. Something I do know for certain is that getting a consistent solid color (no special properties like flakes or lightness) is much easier than attempting to do the same with a metallic or mica color though – getting a consistent shade with the latter usually requires much more finesse than just laying the paint down until it stops getting any darker. Very ironically, a part of what bothered me so much with the original build was how the wheels in the front were so much more cambered than the ones in the rear. It wasn’t intentional – it kind of just happened that way, and at the time I didn’t know how to fix it. Flash forward to the revised build with the Work Meisters and the fronts are still more cambered than the rears, but this time I did it intentionally to preserve the amount of low up front while maintaining the tire-to-fender fitment. It’s also not as severe a difference as it was before – now it looks natural. I really only just noticed it now – did the NSX always have such sad eyes?! Opening these things up is still a very scary task – chipping the paint again is a real concern. Thankfully with all my fiddling to get them to work, they come up reliably every time. The NSX isn’t quite as well known for its pop up lights as well as cars like the NA Miata are. The irony comes when Tamiya decided to engineer the system into the NSX but left the Miata with fixed closed housings. Moving on to the all-important heart of the car. For all my talk of wanting to keep the motor visible through the rear windshield, in the end it’s ironically barely there, thanks to the tint and metal engine screen. Thank you so much for keeping the bay accessible, Tamiya. Why you guys decided to omit this function in the newer NSX still baffles me. The cover screen is thankfully still removable, since it just clips in on two tiny pegs and will stay where it is unless turned upside down, allowing the engine bay to come into full display whenever you please. I was debating adding more detail to this bay with the use of wires and extra detail parts, but in the end decided against the extra trouble since it looks fleshed out as it is. The detail for the interior is actually very visible – the cabin lets a lot of light in, especially with those paper-thin A-pillars. Unfortunately this detail is still hard to capture on camera, thanks to the lighting glare on the windows. One of the most attractive and detailed undercarriages I’ve built so far. The contrast between the regular silver and the chrome is actually more apparent than I thought – I’m certainly glad that extra effort wasn’t wasted. The staggered fitment isn’t actually as prominent as I was originally hoping it would be on the final product. Even here, you can barely tell that the front wheels are smaller than the rears, mostly because the tire profiles are the exact same. I wish I found smaller tires for the front 17″ rims, but that seems to be a rarity in the model car world. Juxtaposed with my second gen NSX. They already barely look related – the different ways in which I chose to build them just widens that divide. I have a bad feeling it’s going to be very difficult to top this build in terms of cleanliness and paint finish. I like to think I’ve now perfected the art of achieving a smooth gloss finish, but realistically the work here was probably more fluke than fine science. This kit’s base model is actually quite dated – the Type R is just a re-release of the original Tamiya NSX kit that came out way back in 1992, this time with the R goodies like Enkei wheels, Recaro seats, and photo etched parts. Despite that age though, I honestly enjoyed it much more than Tamiya’s latest 2017 NSX – maybe it’s just because the 2017 model is much more curbside (no opening/moving parts) than this kit is, even if neither of them actually offer much as display models. where can i get a kit like this and how much is it ?